SAN FRANCISCO, Aug. 31, 2016 /PRNewswire/ -- Imagine laying in a soundproof room in a shallow tub filled with warm water filled with 800lbs of Epsom salt to allow your body to float effortlessly and feel weightless. Removed from all distraction and the noise of daily responsibility, you experience profound relaxation as you rest in a flotation tank, also known as an isolation tank or a sensory deprivation tank. Floating has seen exponential growth within the last few years and is one of the fastest growing niche industries in the country. On August 20-21, the 2016 Float Conference in Portland, OR brought together the float community for workshops, activities, and conversation on how to educate more consumers about the practice of floating. "The growth of the float industry has been mind boggling. It seems like every time we turn around there are a dozen new float centers that opened up. And every one who is opening seems to be doing it out of a love of floating. It gives me confidence that this is just going to continue to grow," said Ashkahn Jahromi, host and MC for the 2016 Float Conference and owner of Float On. "We can really see the rapid growth at the Float Conference each year. This year there were 700 people there, which was hundreds more than we had last year. At this point it feels like we should all strap ourselves in, because we're about to blast off." While in a floatation tank, outside stimulations such as sound, sight, touch, gravity, and temperature are restricted as much as possible, allowing the subject floating in the tank to quickly enter into a deep state of relaxation. According to several studies, including one from a journal of alternative medicine, the beneficial effects of floating include deep relaxation, increased optimism and sleep quality, and relief from stress, depression, and pain. Others have experienced faster recovery from injury, reduced blood pressure, and enhanced creativity and problem-solving abilities. The water in flotation tanks is saturated with high levels of Epsom Salt (Magnesium Sulfate), which can keep any body afloat. Most tanks require about 800 lbs. of Epsom Salt to allow subjects to be completely buoyant. The #1 choice for float therapy is USA Made Epsoak Epsom Salt, a premium grade Epsom Salt from the San Francisco Salt Company. "The 2016 Float Conference just came to a close and was a huge success. We have been attending for several years and are amazed at how fast this holistic therapy is growing," says Lee Williamson, president of San Francisco Salt Company, the major supplier to the float community. He adds, "Over the past six years, we have seen a huge upswing in our Epsoak USA made Epsom Salts not only due to the growing demand from the float industry, but also the loyalty of the float centers who continue to order our salts. Float clinics have been trending towards USA Epsom Salt due to the pure quality, quick service, and our satisfaction guarantees. Epsoak Epsom Salt baths at home are also becoming more popular as people become aware of the many benefits available through bathing with Epsom salt." To find a flotation center near you, web search "float centers near me." 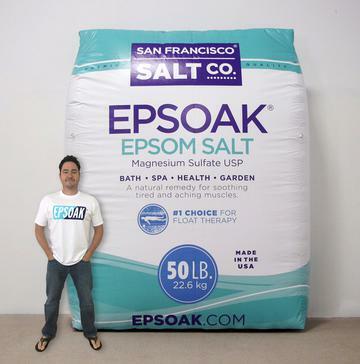 To purchase Epsoak for your home bath or flotation business, visit www.sfsalt.com. Launched in 2002, the San Francisco Salt Company was the founder's entrepreneurial dream and embodies his principals of quality, value, and customer service. They are a major supplier of Epsom Salt, and are the fastest growing specialty sea salt company in the U.S. according to the 2015 Inc. 5000 list. They have a diverse line of bath and spa salts as well as gourmet chef salts. For more information, please visit //www.sfsalt.com or find the brand on Facebook, Twitter, and Instagram.